How many times have you heard the popular adage 'when in Rome, behave like Romans'? Or when you are having a heated argument with your sibling, have your parents called out that you guys are 'fighting like cats and dogs'? While these phrases might make no sense when taken in their literal meaning, they do have a strong connection to the situation they are used in. These phrases are called proverbs, or adages, and are used at different times, situations and connotations. Caption: Spike and Tom, the characters from the famous cartoon show, Tom and Jerry, are a perfect example of 'fighting like cats and dogs'. Learning proverbs is not only fun, but also essential for someone who is learning English language. Proverbs form an integral part of the English language, and lend it a polished and sophisticated touch. In layman's words, a proverb is a moral that contains a certain amount of wisdom. Proverbs are often backed by stories, that help one to understand the proverb in a better way. Certain proverbs are exclusive to certain countries or sects, while it is also possible that there may be different versions of stories leading to the same proverb. Proverbs vary in nature. They can be negative, positive, parallel phrases or declarative. Whatever their nature is, one thing is given – proverbs give the speaker an opportunity to air his views without offending anyone. Since, the nature of proverbs is imperative, it saves the speaker from making any direct remark, while also making his stand clear! Are you fluent in proverbs? It is a known fact that adults use proverbs more than children. The reason behind this is simple – becoming proficient with proverbs requires learning and experience, which children lack. However, it is not necessary that children cannot learn and use proverbs fluently. With the required understanding and learning, anyone can become fluent with proverbs. 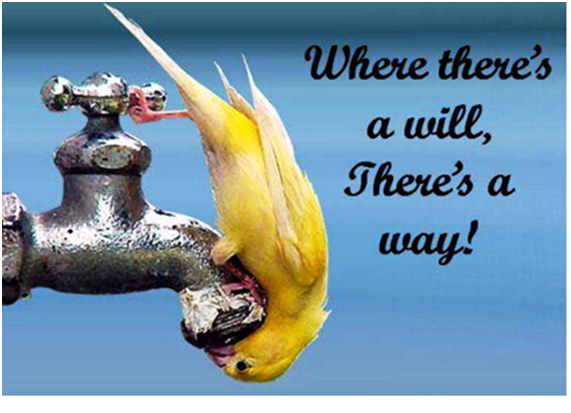 'Where there is a will, there is a way' - so that's the first proverb for you, right there! Fluent English speaking is simply about how well you can put together English words and form a sentence. Speaking English fluently is a skill, and one requires to master the different aspects of the English language, and proverbs are one such important aspect. How can you learn proverbs? 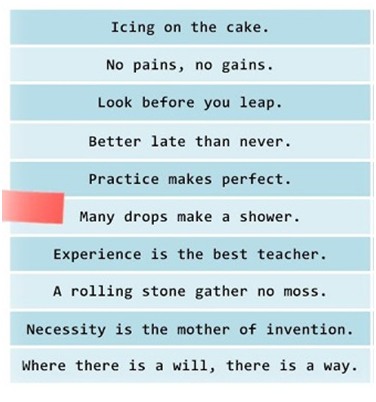 The methods of learning English language apply to learning proverbs as well. Learn, memorize and practice – that is all you need to do for fluent English speaking, laced with the choicest of proverbs. The fun part of learning proverbs are learning about the related anecdotes as well. So much so that once you start learning proverbs along with their connective stories, you will find it harder to give it up! That's the charm of learning proverbs – it will get you hooked. Caption: If you really wish to do something, there is very little that can stop you! There are many ways in which you can learn the various proverbs. There are online websites and libraries, which are valuable resources of proverbs. Also, there are books exclusively dedicated to the topic of proverbs. What you should also do is pick out proverbs from the text you are reading and try to find their related stories. 3. It takes two to make a quarrel but only one to end it. eAgeTutor.com is the premier online tutoring provider. eAge's world class faculty and ace communication experts from around the globe help you to improve English in an all round manner. The assignments and tasks, based on a well researched content developed by subject matter and industry experts, can certainly fetch the most desired results for improving spoken English skills. Overcoming limitation is just a click away in this age of effective and advance communication technology. For further information on online English speaking course or to experience the wonders of the virtual classroom, fix a demonstration session with our tutor. 1. What are some phrases for conversation?